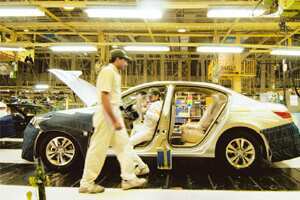 New Delhi: Factory output surged in September, strengthening the prospect of the economy having embarked on the path of recovery after last year’s slump. Industrial production grew at 9.1% in the month, slower than August’s 11% jump, but maintaining the growth trend for the fiscal year that began on 1 April. The effects of the erratic June-September monsoon on agriculture could still act as a dampener on overall growth for the fiscal year. “So far it appears to be a sustained recovery, but it is too early to say whether drought, which affected a large part of the country, will have an impact," said the country’s chief statistician Pronab Sen. “Consumer non-durables is already doing badly, though consumer durables are doing well due to the festival season. The impact of a bad rabi crop will show up a little later." Industrial production averaged 6.5% in the first half to September, faster than the year-earlier 5%. The trend was also reflected in October export data that was released on Wednesday, which showed that key sectors may be heading towards a recovery as the decline slowed to 11.4% against a 13.8% contraction in the previous month. June clearly marked the turning point for the Index of Industrial Production (IIP), when growth surged to 8.32% from 2.07% in the previous month (May). With the Reserve Bank of India signalling a withdrawal of the expansionary monetary policy that was introduced as part of stimulus measures, some experts, such as Siddhartha Roy, economic adviser to the Tata group, advised caution on raising rates too soon. “There are a few preconditions if we want to achieve overall 7.5% industrial growth in the current fiscal. Interest rates should not go up," Roy said. “There is a tendency at present where banks want to lend only to large borrowers. Banks should take a little more risk and lend to small and medium enterprises as well as to consumers." Goldman Sachs expects the recovery to lead to a stronger rupee and “300 basis points of tightening in effective policy rates in 2010", it said in a report authored by Pranjul Bhandar and Tushar Poddar. “We expect WPI (Wholesale Price Index) inflation to move rapidly from 1.6% on October 24 to 6.5% by March 2010." While growth in basic goods and intermediate goods is already higher than the last year’s level in the first half of the fiscal, both capital goods and consumer goods grew at about half the rate of last year’s levels, according to data released by the Central Statistical Organisation, the government’s nodal statistical agency. Consumer goods grew at 8.2% in September, compared with 7.4% in August, driven mainly by a robust recovery in the durables sector, which grew at 22.2% in September compared with 14.7% in the previous month. However, the consumer non-durables sector grew at a meagre 2.6% in September. Consumer non-durables contracted 0.5% in the first half, compared with a 7.7% growth in the year earlier. The manufacturing sector, which accounts for about 80% of the production basket, recorded a 9.3% growth in September, compared with 6.2% last year. Both the electricity and the mining sectors also recorded better performances than the last year’s levels. However, out of the 17 industries that constitute the IIP, five industries—food products, beverages, jute, paper products and metal products—recorded negative growth in September. Though there is no imminent risk to growth, the recovery in exports and high oil prices may play a role in determining overall expansion this year, Sen said. “I do not see any obvious risks to growth. Economic growth so far has been entirely led by domestic developments. With the finance minister saying that he is not going to tamper with the support package, I do not see any immediate risk," Sen said. “If at all, growth may have an upward bias if exports pick up. But it is difficult to say which way it will behave as the world market is still depressed. High oil prices could come as a risk only if the world economy recovers at a very fast pace." Bhandar and Poddar said in their economic advisory that too much should not be read into the year-on-year (y-o-y) change. “On a sequential basis, the September industrial production print confirms the message from a wide range of activity indicators such as the PMI (Purchasing Managers’ Index) and motor vehicle sales, that after a sharp pickup from the lows of the crisis, the improvement in economic activity continues at a more gradual pace," they wrote. Given that industrial growth slumped drastically in the second half of the previous fiscal year, the base effect will ensure growth will be much higher in the period starting October. “Over the next few months, we will continue to focus more on the sequential momentum as a better gauge of activity as yearly growth in several activity indicators will likely show huge up-ticks as a crisis-ridden low base comes on board," the Goldman Sachs report said. However, Roy holds that y-o-y data is a better way to look at industrial growth. “As the Indian economy is highly dependent on rural demand, which in turn relies on the behaviour of the agriculture sector, looking at the annual year-on-year data is the best way to measure growth," he said. Roy expects industrial production to grow at 8.5% in the second half. Goldman Sachs expects an improvement in the credit growth numbers due to strong consumer and business confidence, and an expected pick-up in credit growth in the second half of the fiscal as “corporates need to fund capex plans via debt after having raised significant amounts of equity". It also expects the ongoing improvement in global demand to likely increase credit demand from the export sector.